Doctor Who is only three episodes into Season 9, and already the series has shifted the status quo…well, more than normally, anyway. Aside from the TARDIS, the Time Lord’s most recognizable piece of his technology is his sonic screwdriver, which is infamous for getting him out of many a jam with its countless features. 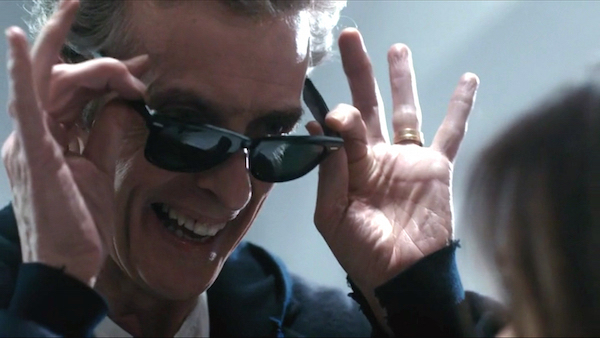 However, after losing his screwdriver in “The Magician’s Apprentice,” the Twelfth Doctor revealed that he has a new sonic substitute: sunglasses. Reception to The Doctor’s wearable technology has been polarizing at best, but showrunner Steven Moffat has no regrets about the change. Sometimes you have to be heretical. Sometimes you actually have to embrace the heresy. And I just thought, really, on a whim, why would The Doctor feel wedded to a screwdriver? Maybe he fancies varying it for a while, maybe he’ll pop his sonic glasses on instead. Also, it maybe resurrected the original joke which we’ve sort of slightly forgotten, that the screwdriver was just a screwdriver that made a noise. It’s gradually become this all-purpose everything that looks really cool… It’s fun to be naughty. Although this is the first time we’ve seen The Doctor ditch the screwdriver in the Doctor Who revival, it isn’t the first time in the show’s 52-year history he’s gone without the trusty device, which was introduced in the Second Doctor story “Fury from the Deep.” During the Fifth Doctor’s tenure, the showrunners decided to write out the screwdriver, believing it limited the script, which left the Sixth and Seventh Doctors without one. It was briefly seen in the 1996 TV movie featuring the Eighth Doctor, but when Doctor Who came back in 2005, that’s when it became a staple possession for the protagonist. Claiming he’s “over” screwdrivers, The Twelfth Doctor’s reason for switching the sonic technology over to shades was because the screwdriver apparently spoiled the line of his jacket. Going off the trailers released before Season 9 started, it looks like he’ll be using them for the reminder of the season. Still, given how popular toy versions of the screwdriver are, we suspect that the trusty tool will eventually return to the show, if only to help out with merchandising. Ray-Bans just don’t have the same appeal for kids and cosplayers. You can watch the video below to hear Moffat’s full comments on the sonic shakeup. U.S. viewers can watch The Doctor show off his sonic sunglasses as Doctor Who Season 9 (Series 9 for U.K. folks) airs Saturdays at 9 p.m. EST on BBC America.